There are few things as stressful as going through a divorce, but when you couple that with a need to obtain the financial clean slate that a bankruptcy action may provide, it may prove overwhelming. There are some things to consider when deciding whether, and how, a bankruptcy action contemporaneous with a divorce may benefit a person. It is common for a couple who has decided to divorce to also consider filing a bankruptcy action, as financial difficulties play a large role in many divorces. One of the first questions to ask yourself is whether to file jointly as a couple prior to the divorce or whether to wait and file an individual bankruptcy case after the divorce has been finalized. Filing during a divorce enables a couple to liquidate certain debt in order to have a simplified division of assets and liabilities after the divorce. However, there are circumstances where a person may want to go through the divorce, including the equitable division of property, and then commence a bankruptcy action. There are two common bankruptcy actions that are pursued by individuals, Chapter 7 and Chapter 13. These bankruptcy cases have very different outcomes. A Chapter 7 case is often referred to as a liquidation bankruptcy as the goal is to eliminate certain debt as opposed to reorganizing it and making payments. In order to file for Chapter 7, there are income restrictions. If a couple, or individual filing alone, exceeds the established median income, then they would have to file a Chapter 13, where there is a bankruptcy trustee who is assigned to the action and oversees a repayment plan for creditors, which is in place for between three to five years. 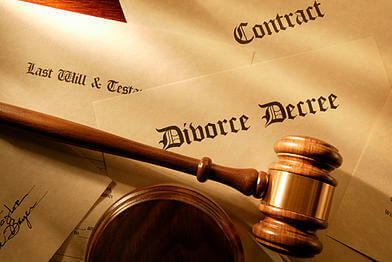 It is important to decide if this ongoing obligation would work for a couple going through a divorce. Once the divorce has been finalized, it may be beneficial for an individual to file a Chapter 13 action. There are many reasons why individuals file for bankruptcy, but the financial uncertainty surrounding a divorce often prompts people to make the decision to pursue a bankruptcy case. It is important to understand the different options and how they will affect you before deciding which path to pursue. If you live in the Roswell or Alpharetta area, the experienced bankruptcy and divorce attorneys at Charlton & Glover are ready to help you. Call us at (770) 993-1005 to schedule a free initial consultation.